DLPAL DQ software does it again. After the close of last Friday, May 25, 2018, it identified one of the few Dow stocks the positive return on the next trading day after Memorial Day, Tuesday, May 29, 2018. Below are the details. 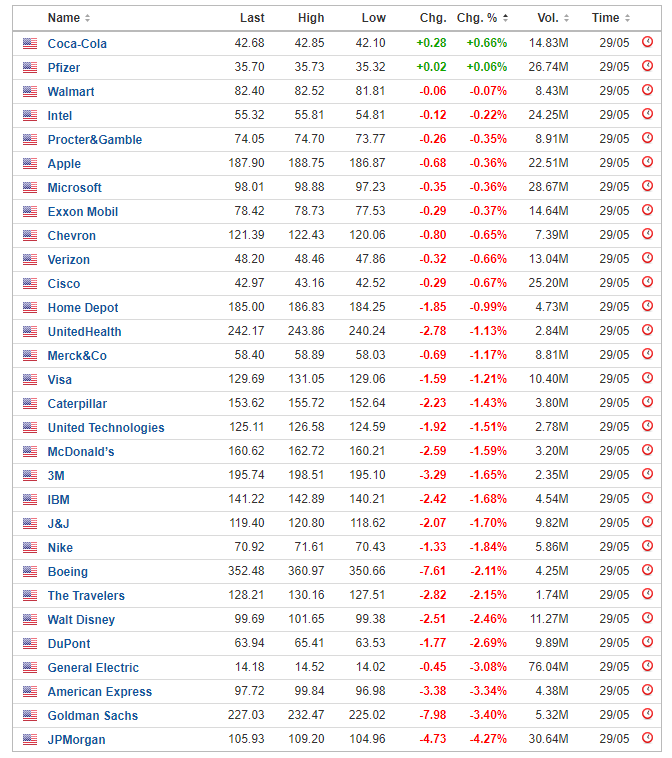 Below are the results of the standard scan of DJIA components DLPAL DQ executes after the close of each day. The parameters of the scan are the same every day. DLPAL DQ identified two stocks with higher probability of rising, JNJ and WMT, and one stock with higher probability of falling, TRV. Note that these signals correspond to micro-anomalies in price action. 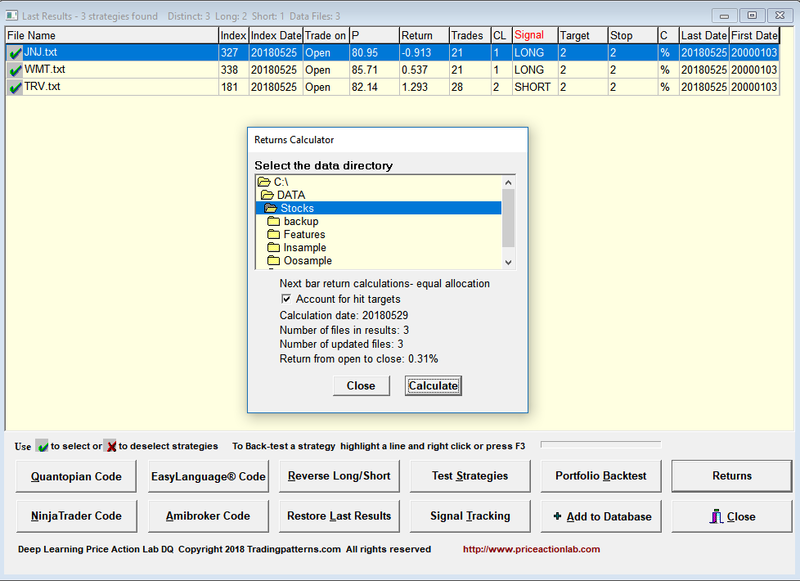 We usually validate DLPAL DQ signals by backtesting them on all DJIA components. This is easily done in the software with a click of the mouse. Below are the results. Note that P and PF refer to the win rate and profit factor of the portfolio, respectively, Port E is the expectation of the portfolio and Win Rate is the percentage of stocks with positive performance in the portfolio. For more information see the online program manual. 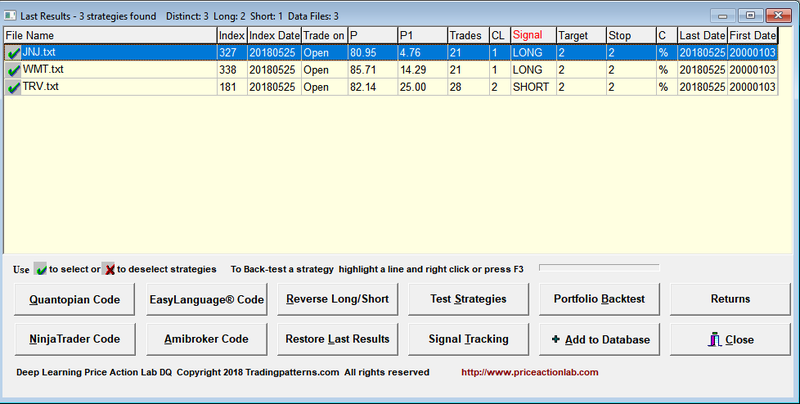 Based on the portfolio backtest results, WMT has the highest chances of generating a profit, especially from open to close of the next trading session. 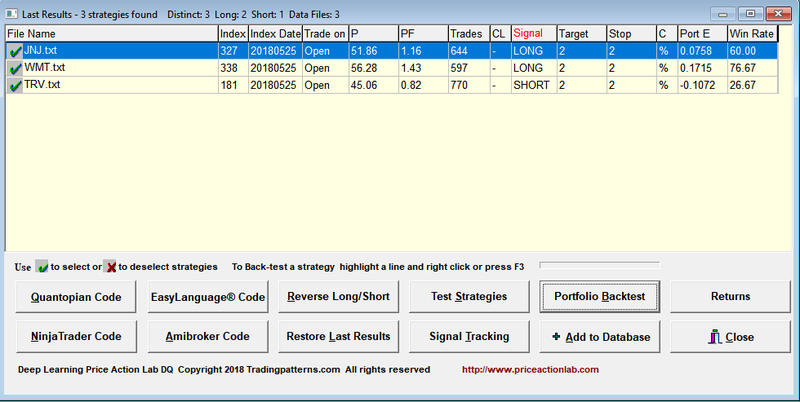 A good signal usually has profit factor P > 1.30 and Win Rate > 67%. It may be seen that WMT generated about 54 basis points of profit from open to close despite a 1.6% down market for DJIA. The TRV short generated a profit but this can be random result. Actually, on May 29, 2018, only two DJIA stocks gained, KO and FE, and from those that fell, WMT was the least down for the day, -0.06%, as shown below. From open to close, WMT was also the third most profitable stock after KO and PFE. For more articles about all DLPAL DQ click here.